Apple’s release of iOS 4.3 has caused some incompatibility problems for augmented reality company Layar. Some images and icons in Layar's client are displayed incorrectly or not at all, the company said in a blog post on Tuesday. Layar’s augmented reality browser is having problems running on iOS devices since the iOS 4.3 update came out. Layar’s augmented reality software works by using the mobile phone’s camera, accelerometer, compass and GPS to identify the user’s location and field of view. Based on these geographical coordinates, content is added over the camera view, in so-called layers. Layers can, for example, show directions to stores or add historical landmarks that no longer exist. Changes to the APIs (application programming interfaces) Apple provided have caused the client to fail, according to Layar. Users that haven’t installed iOS 4.3 should hold off for a few days if they plan to continue using Layar, the company said. However, they will not have to wait long for an updated client. It should be available in the App Store in a day or two, according to the blog post. Layar apologized for the inconvenience, and said it hopes users are patient. 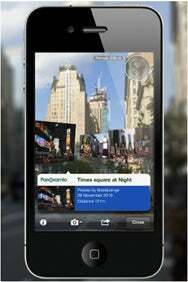 In addition to iOS, Layar’s software is available for Android, Samsung's Bada and Symbian. The Symbian client was released about two weeks ago, and the company is excited to see what usage it gets, said Layar co-founder Maarten Lens-FitzGerald. Today, Layar has more than 1 million active users and offers more than 1,500 layers.